Quantic PhD student Alba Cervera-Lierta and our P.I. José Ignacio Latorre have published a new article on Journal of Physics A: Mathematical and Theoretical. The article title is “Multipartite entanglement in spin chains and the hyperdeterminant” and the reference is J. Phys. A: Math. Theor. 51 505301 (2018) (arXiv: [quant-ph] 1802.02596). In this work, they study the multipartite entanglement in spin chains, in particular in the Ising model, XXZ model and Haldane-Shastry model. As a figure of merit to quantify multipartite entanglement they use the Cayley hyperdeterminant, which is a polynomial constructed with the components of the wave function which is invariant under local unitary transformation. For n=2 and n=3, the hyperdeterminant coincides with the concurrence and the tangle respectively, well known figures of merit for multipartite entanglement. For n=4, Hyperdeterminant is a polynomial of degree 24 that can be written in terms of more simple polynomials, S and T, of degree 8 and 12 respectively. They observe that these polynomials are able to capture the phase transitions present in the models studied as well as a subclass of quadripartite entanglement present in the eigenstates. Besides spin chains, they also study the quadripartite entanglement of random states, ground states of random matrix Hamiltonians in the Wigner-Syson Gaussian ensambles and the quadripartite entangled states defined by Vestraete et al in 2002. 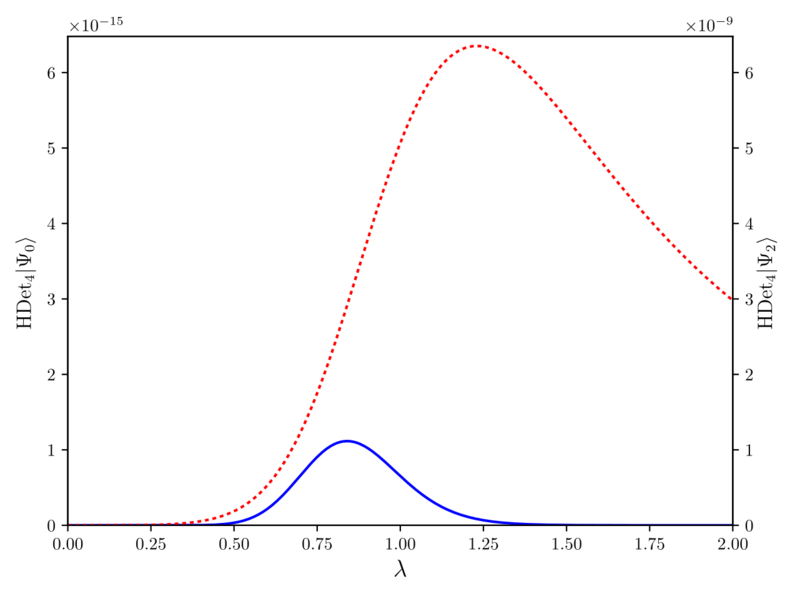 This figure shows the hyperdeterminant for the ground state and second excited state of a n=4 Ising spin chain as a function of the transverse magnetic field λ. For an infinite chain, this model has a phase transition at λ=1. As can be seen, the hyperdeterminant peaks close to this phase transition. 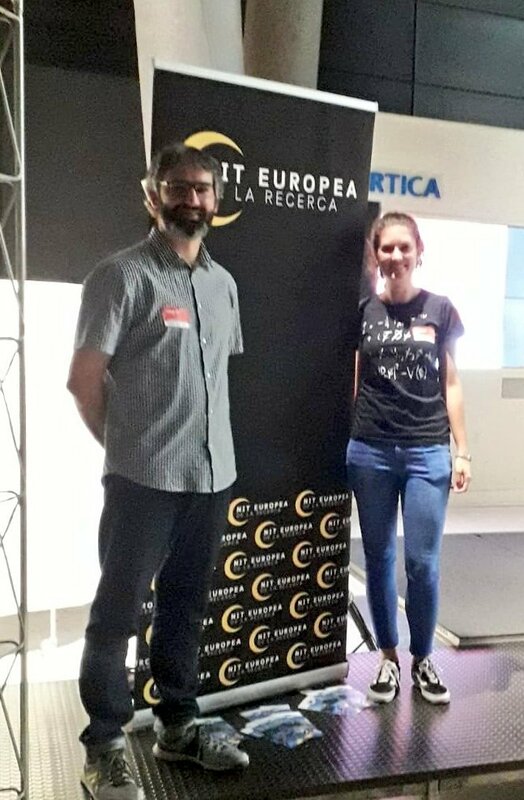 Pol Forn-Díaz and Alba Cervera-Lierta have participated in European Researchers’ Night 2018 by giving a talk at Cosmocaixa, Barcelona. They gave a microtalk which consisted on 8 minutes talk about some scientific topic explained to a general audience. First, Alba presented what is a quantum computer and what are its aplications: to study new chemical reactions, to solve optimization problems or to simulate quantum systems. Second, Pol explained how it works and what is the appearence of its building blocks, qubits. In particular, he showed how is our quantum processor made of superconducting qubits. Quantic team members are very active in scientific outreach activities. Follow us on twitter to stay informed about future events! For that reason, we have created a new section in Quantic webpage, Media, where we collect everything releated with our group that comes out in the news: interviews, radio podcasts, videos, … You can also check there outreach material written by our team and collaborators. We will update this section periodically.